This is a new website, updated with the new models I’m building and some new photos of the models I’ll continue to make. The first new model is a classical guitar I designed in Summer of 2018. The guitar is full sized, but has some nuanced outline drawing. I narrowed the lower bout and rounded over the upper bout shoulder a little bit. The result is a full sized classical, although it feels smaller and intimate for people who don’t want a big guitar. The new model is called the Alameda Model and you can see photos of it on the website under the ‘guitars’ tab. I’ll talk more about how and why I designed it, and what that means for sound production. Now I want to draw your attention to the first photo in the new blog. 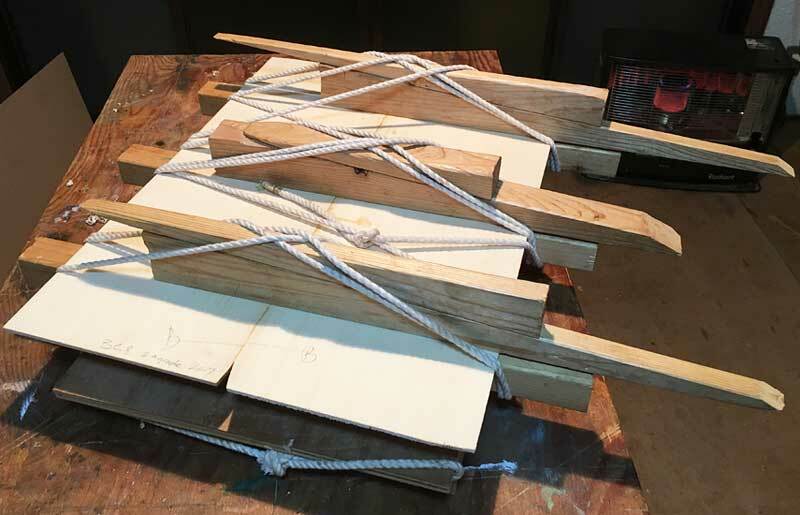 It’s a work board contraption with big wooden wedges and ropes. It’s a fixture used to join tops, and this week I’ll be joining several tops to get ready for the next guitars I’ll be making on order. I’ll be doing five or six tops this week, and then inlaying rosettes in them.